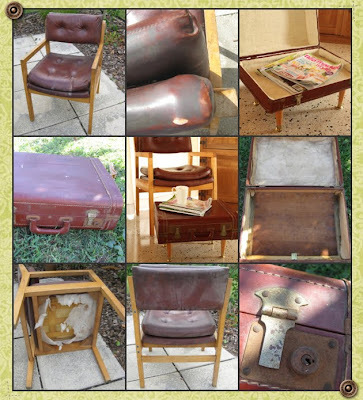 I love both pieces, especially that vintage luggage transformation. That is amazing. I would NEVER have thought the chair could be redone and made so gorgeous but the pairing with the suitcase is just brilliant. Thanks so much. It was fun to find them both and realize they were meant to be together. I'm glad you stopped in. Came over from Functional Friday to see the suitcase - I just got one like this, and I have been exploring ideas (besides stacking and using for storage.) I'm adding this to my idea list. I think this is just pure serendipity! They were meant for you to find them and pair them up. I have a suitcase footstool in the works right now. Can't wait to finish it, but having issues with stability too, but different reason than yours. It's a less vintage/cool looking case. Both pieces are fabulous. The footstool looks great as low side table--a great alternative since the suitcase won't bear much weight. Love this idea! Seriously??? I can't believe you were able to bring that chair back to life, not only that you gave it a mate! Thanks for linking the duo up.